Until now, it has been difficult to find photographic prints made from the same negative but in different processes that allow one to compare - apples-to-apples - the similarities and differences of various processes. 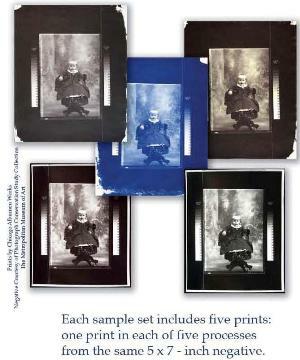 These prints provide the opportunity to examine the general features and compare detailed characteristics of different processes: the single-layer structures of the cyanotype and salted paper print; the two layers of the albumen print; and the three layers found in the glossy and matte gelatin prints. Using magnification, the same details in each type of print may be compared, clearly revealing the tell-tale traits of the various print layer structures. Each sample set includes five prints: one print in each of the following five processes from the same 5 x 7 - inch negative.